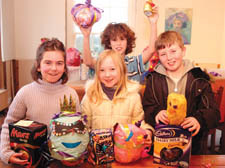 CHILDREN got a treat on Easter Sunday at the annual egg hunt at Lauderdale House in Highgate. Despite the freezing weather, more than 100 children took part in the festivities, decorating eggs made of newspapers with vibrant colours, stars and glitter. They were also given the chance to win chocolate by searching for tokens. But the highlight of the day was the egg-rolling competition, for which there were three categories: three to five-year-olds, six to seven-year-olds, and children above eight. Clad in mittens, woolly hats and wellies, the competitors rolled eggs down the slope of a hill in Waterlow Park. Carolyn Naish, director of Lauderdale House, said: “Because of the weather there was a bit of a jumble and an overflow, with the children crammed into one of the rooms in the house.